Davidson Ready Mix & Construction, Inc. has been in business since 1966. Davidson Construction, Inc. is principally engaged in the business of grading, scraping and preparing streets, road, and building sites prior to paving or resurfacing. Typical road equipment such as backhoes, bulldozers, scrapers, road graders and trucks are used for contracted projects. The operations of Davidson Ready Mix, Inc. include two concrete ready-mix plants and delivery service along with the sale of septic tanks, gravel, rock and concrete blocks. Davidson Construction started in 1965 by Ronnie Davidson. He started with a Bucyrus Erie Dragline and started digging cattle ponds, cleaning ditches and building roads. In 1966 Davidson Construction bought the Holt Creamery Building which was made into a shop. Davidson-Kruta Ready Mix was started in 1973. The business started with three mixer trucks, two 1958 Whites and a 1958 Ford. In 1976 an addition was added to the north side of the creamery for more shop room and the first diesel mixer truck was purchased. In 1980 Davidson Construction had their first road construction job in Williams, Minnesota, on CR #14. In 1988 the Walton Implement building in Middle River, Minnesota, was purchased. The building is currently used for machine maintenance. The Ready-Mix plant in Thief River Falls, Minnesota, was purchased in 2003 and in 2004 a new office building was built in Holt, Minnesota. Davidson Construction has completed projects ranging from $1,000 to $3.5 million. Our projects include residential, commercial, state and county projects. 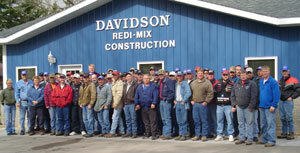 Approximately 65 people are employed by Davidson Ready Mix & Construction, Inc. on a seasonal basis.